What’s new in Clarion 7.1? As we are working hard to closing the next and greatest release of Clarion, I wanted to share with you my presentation at the 2009 Aussie DevCon and present to you a quick summary of features to look forward to in the days to come. New Windows 7 manifest support, built into the application’s template support. Expanded support and customization for the Command Line Interface Utility (ClarionCL). You can now build and run applications and convert dictionaries from outside the IDE. 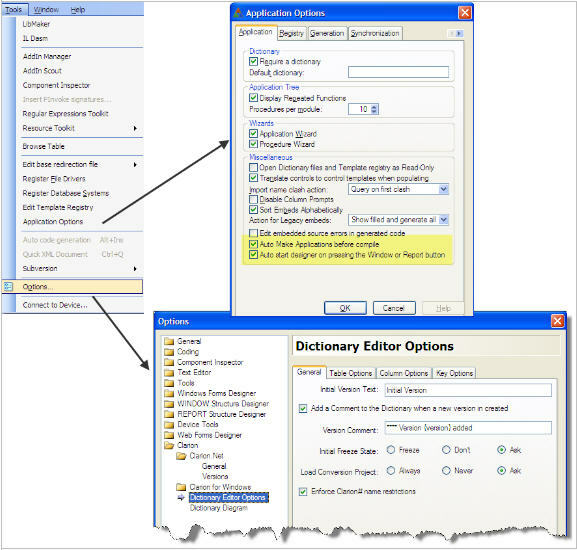 You can specify dictionary (DCT) files are automatically imported and exported to text format. The Tools/Options/General/Binary File auto-export/import dialog allows you to configure this. Subversion features of the IDE will use the text representation of a dictionary rather than the actual dictionary (DCT) if the dictionary is registered to auto import/export. Window and Report tab controls have been replaced by Buttons. 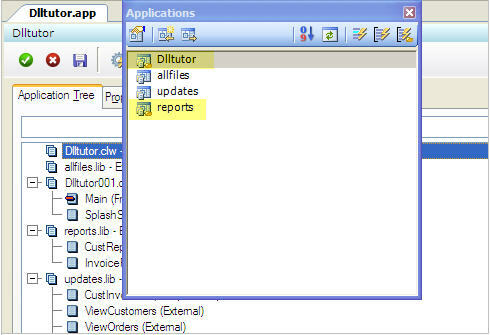 Additional ellipsis buttons added to call the Window or Report Editor to view source. If you press either the Window or Report buttons on the main application tree, you now return to the application tree when you have finished using the formatter. New Save and Exit button added to Application Tree. This distinguishes the Save and Closing of the Application Generator from other dialogs. New Application Option to control the size of the recovery file before an AutoSave occurs. New and improved Window Preview option built into the Structure Designer, with advanced data configuration options! You can now set the tab style that the Window Previewer will use via the Tools > Options > Clarion > Window Previewer panel. New and improved Expression Editor interface! You can now open multiple solutions that access the same dictionary in multiple instances of the IDE. New option in Class Browser Settings that allows to show/hide entities from included files. Class Browser Settings is a dropdown button on the Class Browser toolbar, and the new option is located at the bottom of the dropdown menu. Objects from included files are hidden by default. New toolbar button and right-click support to specify picture token, heading and justification. Ability added to copy field definitions from source code and paste them into either the Data / Tables Pad or the Dictionary Editor. When copying and pasting the details of a field that has an initial value from the Dictionary Editor or the Data / Tables Pad, the definition now includes the default value where possible. Data/Tables Pad now has Expand All/Contract All buttons. When a group or queue has focus in the dictionary editor or data pad, you can now add a field to the start of the group/queue, to the end of the group/queue or after the group/queue using either the context menu, the INSERT key, or the drop down list on the add button on the toolbar. TopSpeed Driver String Builder dialog now includes support for the TopSpeed Enhanced Encryption Support driver strings. 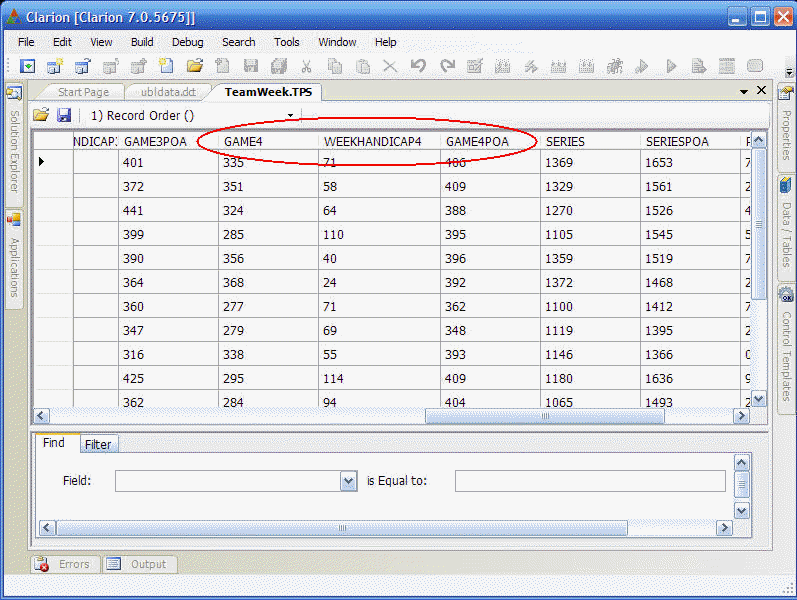 Support for alternate field and blob names for SQL drivers for specific SELECT, UPDATE, and INSERT clauses. 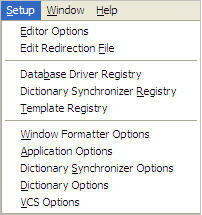 The driver string builder for ODBC based drivers now allows you to set the ZERODATE switch to any date value. Improved support for handling Microsoft SQL Server 2008 data types. You can now set the ODBC Catalog and Schema when importing/synchronizing tables from an ODBC data source. SETEXITCODE and GETEXITCODE built-in functions to set/query program’s exit code (error level) without the necessity to immediately close the program. Two new built-in functions FREEZE/UNFREEZE with the purpose of reducing flicker in some situations. New conditional operator support added to the OMIT and COMPILE directives. New PROPLIST equate (LISTZONE:GroupHeader) used to determine if the mouse is clicked or moved inside the list box header, but outside of the field part of the header. This change has been used to provide better highlighting of themed list box headers. New PASCAL attribute for the #RUNDLL statement. The WIN32 attribute is now deprecated and ignored. I just wanted to mention that our home office will be closed on Friday, July 3rd in honor of Independence Day. To all of you, have a safe and relaxing Holiday weekend and we will be back in the office on Monday, July 6th. Thank You! When I look at the big picture of my life, I guess I have always been a consistent person, living in the same house since 1985, married to my wife for 22 years this October, and bowling every Friday night in a mixed league. Also important, this November marks my 20 year employment anniversary with the Clarion home office. Sounds boring to some, but all of it seems like a blink of the eye to me. So why am I mentioning all of this? Clarion 7 is a major upgrade, and now I had a requirement to upgrade one of my favorite real world applications, my Bowling League Manager. There has been a lot of chatter on the newsgroups regarding problems upgrading applications from C6. I can tell you that “my” producation application is critical to me, because bad bowling statistics can cause discrepancies in standings and individual awards which can cause incorrect league money to be awarded. Many times the bowling center has made mistakes that my audit trail was able to correct, so this program is very important to me. I had a situation last weekend where my bowling league management application needed a major change for a summer league I am running, and I am very happy to report to you that the conversion of my application from Clarion 6 to Clarion 7, dictionary changes, table conversion, appplication window changes, and finally changes in important hand coded processes was smooth and quick and very gratifying. This blog summarizes what I needed to do and how I did it. To torture myself this summer, I accepted an opportunity to manage and run a Sport Bowling League called the PBA Experience (the “torture” is the tough sport bowling patterns). As an incentive to recruit new bowlers, the bowling center had given us four games for the price of three. Now in my 20 plus years of bowling I have always bowled a 3-game series, so it was time to make a change to the league management software. My first step was to convert the Clarion 6 application and dictionary to Clarion 7. No issues to report here, the conversion was smooth and easy. 11 table dictionary, but nearly all tables related. 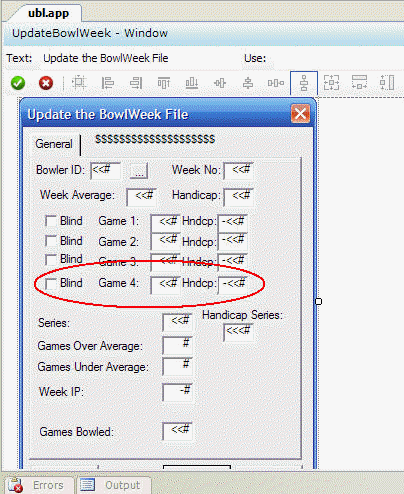 There are Bowlers and Bowler Master and Bowler Weekly tables, and the same thing for Teams. Add the Schedule and Weeks and Divisions and that’s the core of the database. Step 1: Add a Game 4 to the Bowler and Team weekly tables. I used the Dictionary Copy and Paste, copied Game 3, and then renamed the result to Game 4. That’s all I needed to do in the dictionary. The next stop was the Application Editor. Again, it’s a typical application with roughly 50 procedures. Lots of reports and 3 key processes. I quickly got the hang of the alignment toolbar, and decide to use the Populate option in the Menu instead of the Data/Tables Pad. Again, just a creature of habit! I really like the new embed editor, with code completion, quick class browser and all of the other features. In most cases I simply needed to add the Game 4 logic where needed. A lot of it was copy and paste. I won’t bore you with all of the places I changed. I will say that in this case the Data/Tables Pad came in VERY handy, as I was able to easily drag and drop the field names that I needed into the embeds. I wanted to test this quickly since the league was starting in a few days. Looking back, I will add conditional logic to the league configuration file to set it for 3 or 4 games, and then wrap my logic around that condition. The rest of the story was non-eventful…Generate, Build, and Run. The program works perfectly, and in the next couple of days I will add the Game 4 column to a few end of season reports. Here are the procedures that I modified, all in total about 1 hour’s work. In summary, working with Clarion 7 was extremely satifying. I know that there will be other projects that will be more challenging in the months to come. As the project progresses I know there is more work ahead, but I am looking forward to it. Check the Auto-Make Applications before compile box to trigger the Application Generator to generate source prior to the Build action if needed. 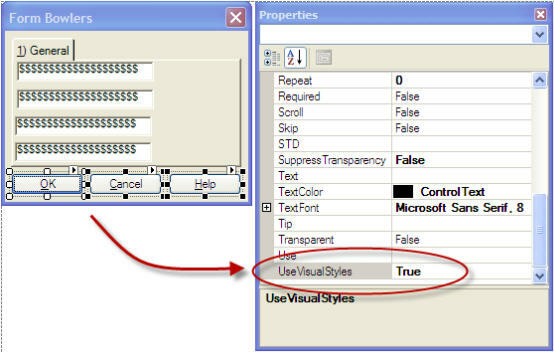 Check the Auto start designer on pressing the Window or Report button box to auto-load the target Designer when pressing the Window or Report button located on the Procedure Properties window. You can still view the Window or Report text by pressing the tabs in the Procedure Properties window. Check the Use long file names for generated files to generate application source files using the full application name followed by a three digit module number. If you would like to use the older 8.2 naming format, clear this box. The Dictionary Editor also has some great new options to help you fine tune your development environment. Set the Initial Version Text to display the text to display when the version is set. When you first create a dictionary it has an initial version with a name equal to what you set in that field. During the lifetime of the dictionary you can create new versions. Each version is a marker that is used in the Audit details of an object. If you go to the Audit tab of any object in the dictionary you will see a Version against the Created and Modified details. This indicates which version of the dictionary the object was created in and in with version it was last changed. The Initial Freeze State defines the initial “Freeze State” of the dictionary components as they are first imported. 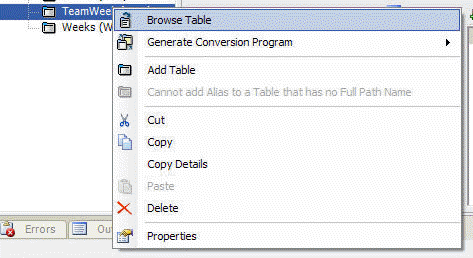 After a conversion program is generated the Load Conversion Project option sets how you can load the project. You can set this to always load the project, never load the project or ask each time a conversion program is generated. The default is to ask. When Enforce Clarion# name restrictions is checked, the dictionary editor will not allow you to create labels that are not valid in Clarion#. For example. AS is an illegal label, but legal in Clarion for Windows. If you do not want to worry about Clarion# restrictions you can uncheck this box. If Clarion# restrictions are enabled and you load a dictionary into the editor that has a label that violates the Clarion# naming restrictions the editor will automatically rename the object to ObjectType_OldLabel, where ObjectType is a Table, Alias, Global, Pool, Key or Column. If the object is a Key or a Column with no external name, the external name is set to the old label. Any such change will appear in the Dictionary Changes pad. Easing into Clarion 7 – Part 8 of 9 – Where’s my Property Editor? 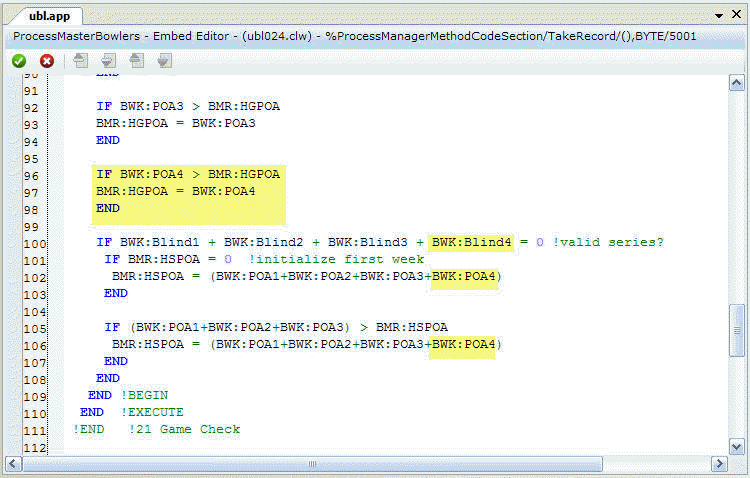 Open this pad in the IDE at any time by pressing the F4 Key. 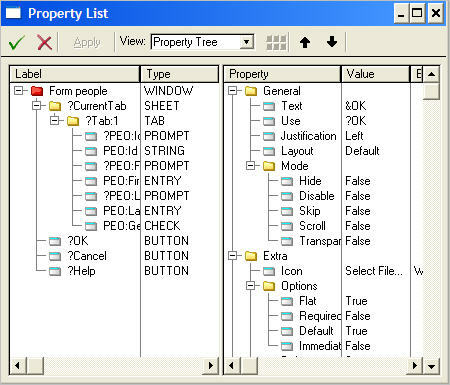 The properties that you will view are based on what IDE element is currently selected. 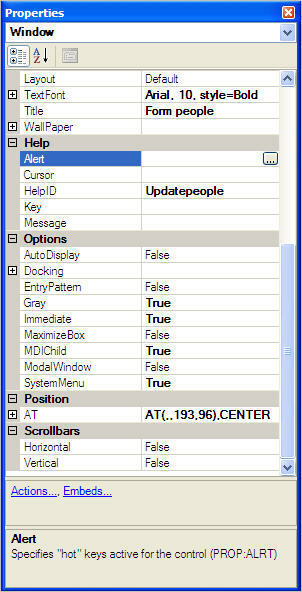 Usually this is a WINDOW, REPORT, or a control, but it could also be one of many project elements. The new Property Pad is easier to use, displays more information in one view, and is more flexible. You can sort alphabetically or by category. To update properties common to multiple controls, simply lasso or select the target controls in the Designer and change all properties as needed. Many property values are comprised of a finite set of choices (i.e., colors), or sometimes just a “TRUE” or “FALSE” value. Use your mouse or cursor keys to navigate to a target property value, and then click or press the space bar to cycle through valid choices. selected application is called lazy loading. In the Clarion 7 IDE, a fully opened application is one that is loaded in the Application Editor. However, applications can also be “lazy loaded”, meaning that the application may not be loaded in the Application Editor yet, but the application template registry and any parsing of source libraries required by the templates has been performed. This allows for faster loading of applications into the Application Editor, and allows the project system to more efficiently build applications that are not currently opened in the Application Editor. Applications not opened or “lazy loaded” are marked with a different icon (shown above not highlighted). The Applications Pad is a powerful tool in the Clarion 7 IDE. For solutions with multiple applications, you can easily select and generate the application that you need. If you select an application to generate, and the application is not already opened, the Generate action will “lazy load” the application as described above. One of the fantastic new features of the Clarion 7 IDE is its ability to manage multiple applications in a single solution. I mentioned this in my very first blog in this series. (See Part One in this series if you haven’t already done so). Every development project is contained within a solution. Of course, you can have a single project associated with a single solution, and for most of the time, this will be the case. However, a solution can also contain multiple projects. As always in Clarion, projects can be hand coded (source only) or, they can be associated with an application file, where templates and embeds are responsible for generating the project source. Since multiple projects can be contained in a single solution, it is also true that multiple applications can also be contained in a single solution. And yes, for your projects where multiple applications were needed (some produced DLLs and one produced the executable), they can now be managed and maintained in a single solution, and you may edit them all at the same time! And this brings me to the main point of this particular blog. An application is always a part of a solution, but since solutions can contain multiple applications, you must be aware that closing an application does not automatically close a solution. 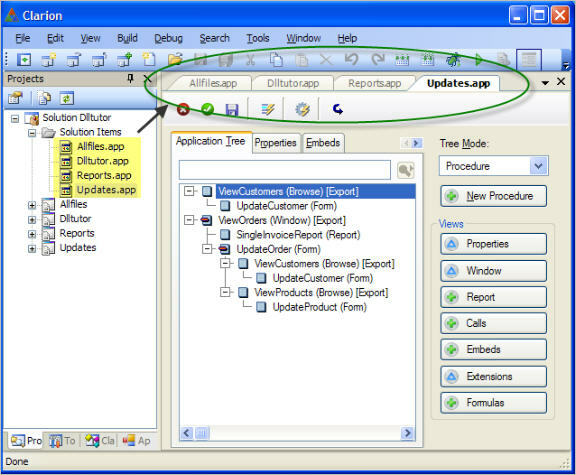 To close an entire solution, first close each application opened for editing, and then use the Close Solution button in the main IDE toolbar (shown here). 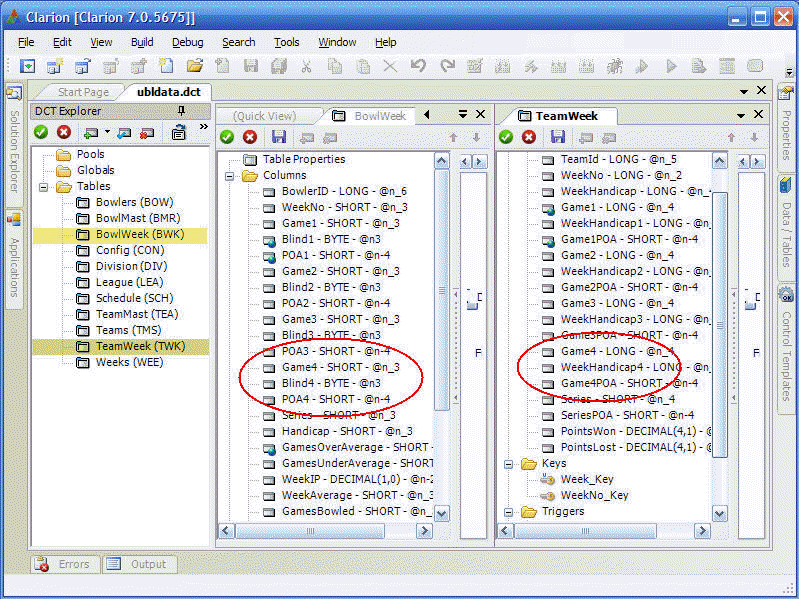 As shown above, you can also use the CTRL + SHIFT + F4 hot key combination (or use the File > Close > Solution IDE Menu item).